There is a whole lot of scenery, history, and activities packed in to this five-day itinerary. Stops in Katoomba and Bathurst take you through the Blue Mountains, exploring the history of gold mining, the Abercrombie caves, and numerous historic sites. Then you are off to Dubbo, where you can tour the Western Plains Zoo and the Old Dubbo Gaol. The last two days of your trip take you to Cessnock in the Hunter Valley Region with its many vineyards, and finally back in Sydney, for some nightlife and fun on the Darling Harbour waterfront. Today is the longest driving day on your itinerary. In just under five hours you will drive 347 km from Dubbo southeast to Cessnock, traveling on the Newell, Golden, and New England Highways. 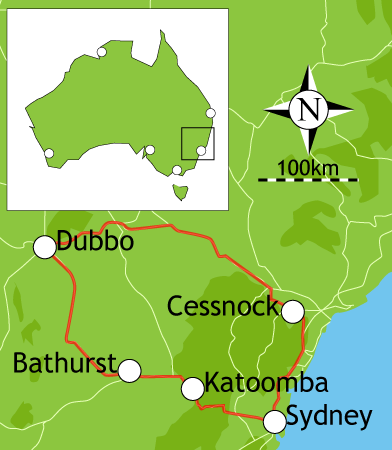 Cessnock is the gateway to the Hunter Valley Region, one of Australia's oldest wine-growing regions. Cessnock began as a traveler's rest on the convict-built Great North Road and is now surrounded by history. Make your way back to your starting point, heading south 151 km (about two hours) and mainly on the Pacific Highway. In Sydney, you can indulge in some of the Emerald City's "Mod Oz" cuisine and a little of the city's famous nightlife. This is where you may wish to extend your trip once you return your rental, and stay at a hotel in the Rocks Historic District long enough to take in Sydney's many world-class attractions.